"Avenue of Regrets is a superb psychological thriller, a gripping tale of violence, tension and intrigue. Highly recommended " --Douglas Preston, #1 bestselling author of the Pendergast series of novels.I was happy once. I just didn't know it. I had a family. I had friends. I had a good job. And one day it all ended.There are defining moments in people's lives; times forever etched in our minds. Some are good. Others not so. For David Wallace, there was no worse time than receiving the news of his family's death while confined to a jail cell on murder charges.Seven years later, David has moved on with his life having started a non-profit shelter for battered women, still haunted by the indiscretion which changed his world forever. But there are dark forces in play demanding a reckoning. As he's besieged by past demons, David discovers enemies and crimes so heinous, and so far-reaching, they threaten to propel him down another avenue of regrets . . .
"Wow. This is quite an amazing read! Avenue of Regrets is a superb psychological thriller, a gripping tale of violence, tension and intrigue. From the very first chapter it propels the reader into a dark world haunted by the demons of the past and the horrific evil of the present. Highly recommended!" --Douglas Preston, #1 bestselling author of the Pendergast series of novels. "An engrossing novel of domestic suspense . . . a fast-paced tale of murder and horrific crime with twists and turns worthy of Hitchcock. Along the way, Pineiro, who's best known for his military/computer thrillers, dishes up some wry reflections on humanity, trust, and forgiveness." "Greed, violence, and the hope of redemption are the defining themes of Avenue of Regrets, a nonstop action thriller . . . perfectly paced, with clues revealed in small doses . . . the writing is tight and smooth and keeps to the nail-biting pace." "A hard-hitting examination of regrets, atonement, and acknowledging sins committed and those imagined. 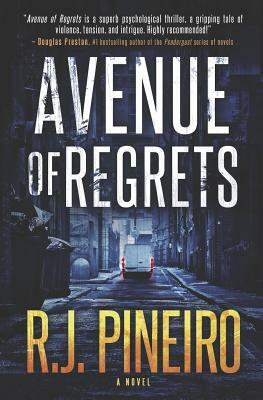 Straddling the line between a mystery investigation and a thriller, Avenue of Regrets takes one man's challenged life and expands events beyond their initial boundaries, treading on the processes of casino mafia members, police protocol, and personal evolution all in one. An absorbing slice of one man's life that traverses pitfalls, potentials, and the delicate art of creating lasting recovery and a meaningful life that's ultimately well-lived." "A riveting crime thriller. Packed with mind-blowing twists and turns, Avenue of Regrets will keep you reading until the very last page." --Cheryl Kaye Tardiff, International bestselling author of Children of the Fog. "Pineiro has crafted a tense mystery-thriller with plenty of surprises and a diverse cast of characters."